The international confusion caused by the Russian annexation of Crimea in February 2014 is a stark reminder of the continuous evolution in modern warfare. As Russian military activities cannot be clearly demarcated from other forms of political activity, the persistent ambiguity between war and peace forces us to reconsider the ethics of war. 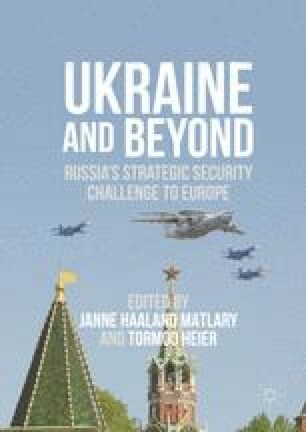 Is there a universal and commonly acknowledged ethical fundamental between Russia and NATO that may regulate politically motivated behaviour? Or are ethics in the twenty-first century exposed to an increasingly polarised interpretation between Russia and the West? Carnegie Endowment for International Peace. 2010. The Military Doctrine of the Russian Federation, Approved by Russian Federation Presidential Edict on 5 February 2010, http://carnegieendowment.org/files/2010russia_military_doctrine.pdf. Fagan, Geraldine. 2015. Putin is Pushing the Patriarch to the Brink. Catholic Herald. http://www.catholicherald.co.uk/issues/february-20th-2015/putin-is-pushing-the-patriarch-to-the-brink/. Goble, Paul A. 2015. Moscow Patriarch says Ukrainian Faithful No Longer Obligated to Obey Kyiv. http://euromaidanpress.com/2015/06/04/moscow-patriarch-says-ukrainian-faithful-no-longer-obligated-to-obey-kyiv/. National Security Strategy of the Russian Federation to 2020. 2009. Approved by Decree of the President of the Russian Federation, 12 May 2009 No. 537. http://rustrans.wikidot.com/russia-s-national-security-strategy-to-2020. Orend, Brian. 2008. War. In The Stanford Encyclopedia of Philosophy (Fall 2008 Edition), ed. Edward N. Zalta. http://plato.stanford.edu/archives/fall2008/entries/war/. Putin, Vladimir. 2014. Address of the President of the Russian Federation, March 18, 2014. http://en.kremlin.ru/events/president/news/20603. Satter, David. 2009. Putin Runs the Russian State—And the Russian Church Too. http://www.forbes.com/2009/02/20/putin-solzhenitsyn-kirill-russia-opinions-contributors_orthodox_church.html. Ticehurst, Rupert. 1997. Article, International Review of the Red Cross, No. 317. https://www.icrc.org/eng/resources/documents/misc/57jnhy.htm.